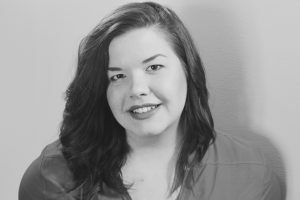 Cassandra Rene is an actor in Blind Nickel Pig and full-time student at Thorneloe University in the Bachelor of Fine Arts – Theatre Performance program, which she will be completing next year. Cassandra is no stranger to the stage as she has worked on a number of projects within the community. Some past performances include: Stephen Berkoff’s Greek (Thorneloe University), All’s Well That Ends Well (Shakespeare’s 400th at Elsinore Castle), There’s A Mouse in the House (Sudbury Theatre Centre). Cassandra is excited to have had the opportunity to work with such an incredible cast and crew on this amazing production. 1. Seven actors take on eleven parts in Blind Nickel Pig. Can you tell us a little about Mrs. Doris Dorland and Frannie Flyberry, the two characters you play? My first step when working on two characters in one show is to figure out and play with their physicality and voice. Frannie Flyberry is the younger sister of Annie Flyberry, played by France Huot. Franny has big dreams of being a famous gunslinger. She is always practicing with her gun, but the other characters don’t appreciate how much she practices. When developing Frannie (which I am still in the process of doing) I like to work closely with my sister actors, in this case France. The sister’s speech should have similar patterns — the physicality can differ, but in those moments when Frannie tries to be more adult-like, she will try to be more like her older sister. I also like to pick an element that my character embodies. Like with Frannie, she has a lot of the water element in her. She is constantly moving, and has a hard time standing still. It just helps give that extra bit of separation to the characters. With Mrs. Doris Dorland, it’s a little different. Mrs. Dorland is a religious woman who does not believe in drinking. She wants to write articles in the newspaper for her “Christian Women’s Temperance Union” but they never get published. A woman that craves to be heard and is trying to be the best person possible (in her opinion) to get that attention. I’ve decided she is a high-strung women and is very proper. I still like to focus on physicality and voice, but I try to make it the opposite of what I do as Frannie. Mrs. Dorland seems like the nagging type and I love to have her voice almost nasally. Her posture is good but also over-exaggerated, for the style of the piece. I am still figuring out her element, but I know it isn’t water! 2. What’s it like working on a show based on local history? Were you aware of any of the people or stories that inspired Lara’s play before starting on BNP? As a Sudbury born girl, I love to learn about my hometown’s history. Pat The Dog always finds the most interesting history and I was very excited to be asked to apart of this production. I had not heard of any of these characters prior to reading the script, and I did not know of the stories. I love how Lara has put all the characters and stories together to create this fun play. 3. How does it feel to transition this play to the stage? I love to play on stage! In past performances of mine, I’ve played very young characters or I’ve had to mime my entire kitchen, and it’s always so fun for me. In this play we have a lot of paper: Jenny Hazelton and Matt Heiti are very creative and I love to see where their imagination takes me next! If there is anything I’ve learned in my past few years of working in theatre, that I want others to know, it is to trust your director(s). When you trust them and they trust you, you all get to play together and then you can create something really cool and really beautiful!